Ronald Klatz, MD, DO, is a physician, medical scientist, futurist, and innovator. He coined the term "anti-aging medicine" and is recognized as a leading authority in the new clinical science of anti-aging medicine. 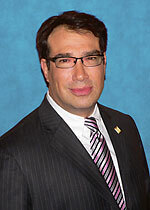 Dr. Klatz is the physician founder and President of the American Academy of Anti-Aging Medicine. In 1984, Dr. Klatz was a pioneer in the clinical specialty of preventative medicine: as a principal founder of the National Academy of Sports Medicine and researcher into elite human performance and physiology. Dr. Klatz is a best-selling author, and is columnist or Senior Medical Editor to several international medical journals. Since 1981, Dr. Klatz has been integral in the pioneering exploration of new therapies for the treatment and prevention of age-related degenerative diseases. He is the inventor, developer, or administrator of 100-plus scientific patents, including those for technologies for brain resuscitation, trauma and emergency medicine, organ transplant and blood preservation. Today, Dr. Klatz helps to support aging-related biotech research and supervises postgraduate medical training programs for physicians from 120 countries. • President and physician founder of the American Academy of Anti-Aging Medicine (A4M), a federally registered 501(c)3 non-profit medical society dedicated to the advancement of technology to detect, prevent, and treat aging related disease and to promote research into methods to retard and optimize the human aging process.